I saw these Cole Haan clogs on Sunday and I haven't been able to put them out of my mind. I had just painted my toes, and these shoes seriously needed some nicely manicured toes. Pronto. I liked everything about them. 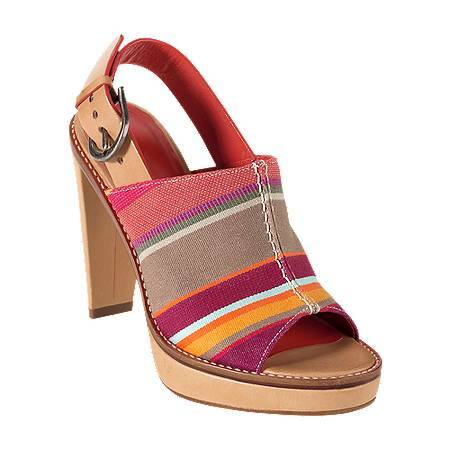 The open toe style of the clog, the color of the leather, the stripe pattern, the buckle, the red lining, and the top stitching. They thought of every detail. How cute would they be (on me) with a pair of capri linen pants, or jeans, or a skirt. This had nothing to do with need. It's all want, baby. There's just one problem. Well technically it's more than one. Three hundred and twenty eight of them to be exact. As in $328. Why, why, why? Why $328? Why can't they be $125 or $150? Seriously though. I guess I'll have to stalk the Cole Haan Outlet for the next 12 months waiting, and hoping, they get there. And are priced less. A lot less. I did splurge on a pair of Cole Haan suede boots once. I got them on sale at Nordstroms, but they were still $250. I wear them all the time in the fall and winter. I keep them in the box in my closet so they don't get dusty. I've replaced the sole once and the caps on the heels twice. I take good care of those boots, 'cuz I kind of love them. I feel happy when I wear them. Even on the crappiest of days. Have you ever splurged on a pair of shoes or boots? What do you own that makes you happy when you wear it?